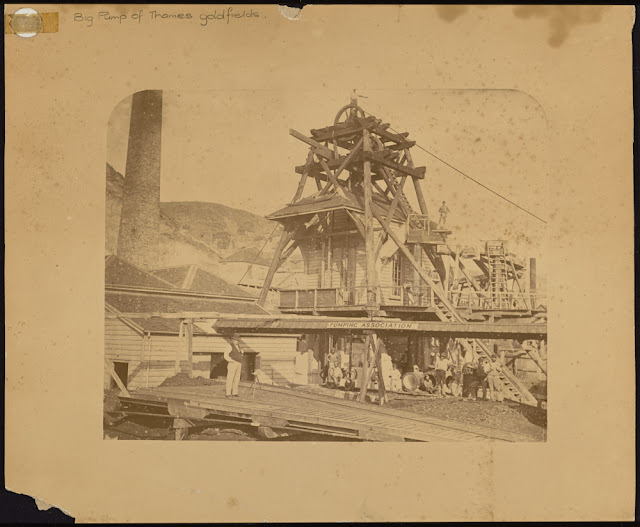 Thames NZ: Genealogy & History Resources: Thames (NZ): Early photographs of the Thames Goldfields. 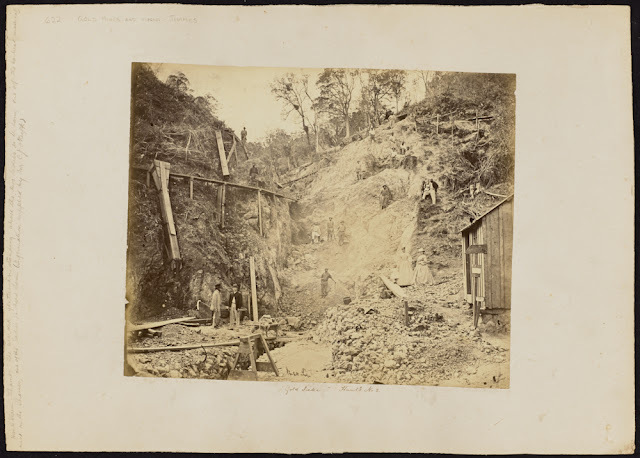 Thames (NZ): Early photographs of the Thames Goldfields. We can sometimes be under the illusion that photography didn't exist when the goldfields opened in 1867. We question why there are not more photographs of those first decades? There will no doubt be lost photographs, over the years people may have thought.."who would want to look at those?" Anyway thankfully to repositories like the Auckland Library, the Sir George Grey Collection continues to throw up some amazing resolution images. Below are a selection of new scans that are available for free online. Remember if you do use these in publications, contact the librarians as a courtesy and get formal confirmation. They do appreciate this, and it allows them to see where the images are reused. When the first miners settled on the goldfield, the majority were sited on Block 27. This was generally marked as south of the Karaka Creek to north of the Hape Creek. It then varied as to whether this was east of Augustus Street or later Rolleston Street. 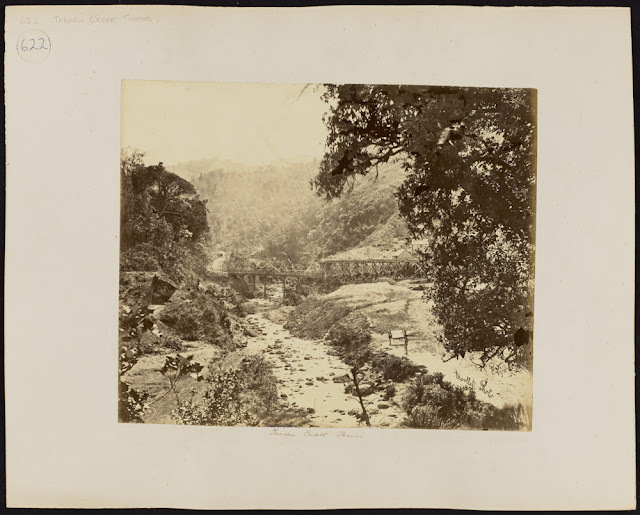 The photograph below is labelled as Karaka Creek 1867. 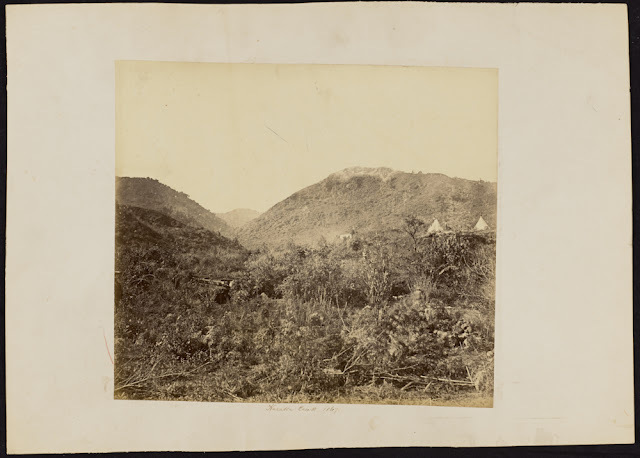 The famous Shotover Claim that launched the goldrush 10 August 1867. Just ten days after the field was officially open, a group of men discovered gold! The rush to the Thames began in earnest. 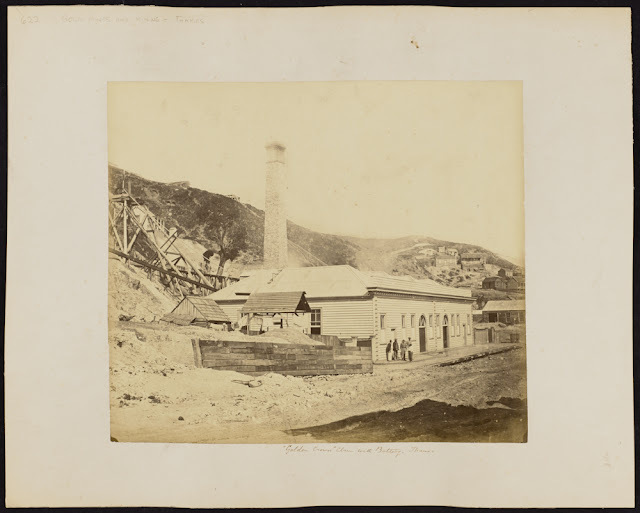 Photo Description: Hunt's Claim at Thames (the Shotover Mine at Kuranui Creek) , Dr Sam? standing half way up the bank with another man and child (right), Mrs Sam? one of the two ladies standing right. The discoverers of the claim - George Clarkson, W A Hunt, William Cobley and John Ebenezer White, may be among the others in the photograph. The Lions Club Heritage sign for the Golden Crown Mine is located on the boundary of the Hauraki Prospectors Association property at the Moanataiari. It reads: "Golden Crown Mine 1868-1886. Another Great Bonanza that produced in excess of $7 Million Bullion (Gold and Silver). The original shaft reached 123 metres. Led to the discovery of the Caledonian Mine. Set up in 1873 and worked until 1900, the Big Pump was used to pump the water out of the Deep level mines. Located just past the intersect with the Moanataiari Creek Road today, it caused a stir a few years back when part of the road collapsed above the remains of the old structure. Further information in an article in the Treasury Journal by David Wilton. These are just a selection of the latest additions to the Sir George Grey Collection, which in includes the Thames photographs by R H Bartlett.